Is Jamie Maclaren really ‘in form’? 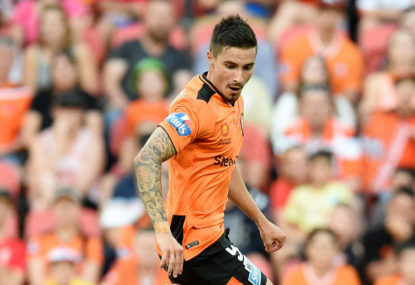 Former Brisbane Roar striker Jamie Maclaren is in better form than Tim Cahill, who has played 159 minutes of football in the whole 2018-19 season. Cahill shouldn’t be in the squad for Russia and with the ‘Cahilltex’ theory moving into overdrive, his selection becomes even more divisive and questionable. I have complete faith in Bert van Marwijk and was a major supporter of his appointment (should’ve been on a full-time basis). But there was a compromise made with the selection of Cahill. So, the argument begins that Maclaren should’ve been chosen instead. I can only imagine how hard it is to select a squad of 26 (to be cut to 23), but a striker cannot be said to be ‘in form’ for scoring a hat-trick a few days before selection. Take away the front man’s three goals against Rangers and Maclaren has only scored five goals in 14 league games in a competition rated 26th in Europe according to UEFA club coefficients! Can we really say he’s in form on the back of all this? He may have deserved a place in front of the likes of Cahill, but we can’t call him in form off the back of one performance, it’s not right. Players like Bailey Wright and Aleksandar Susnjar should be the talking points of all the omissions, especially considering how bad we are defensively only a month out from the World Cup.